Escape to the beautiful palmetto-lined shores of Hilton Head Island with a timeshare at Marriott's Harbour Point at Shelter Cove resort. Find timeshare resales and rentals priced up to 70% below retail costs today. Located beside the sparkling waters of the Atlantic at Shelter Cove, the Marriott Harbour Point resort offers an essential South Carolina escape. Set in the perfect position to discover all Hilton Head Island has to offer, the Harbour Point resort provides a complete vacation experience directly on-site. Amenities and services like the Harbour Point outdoor pool and the whirlpool spa allow daily opportunities to relax, while conveniences like free WiFi and a full-service fitness center cater to guests' other needs. 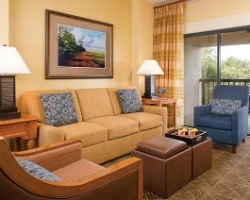 You can also enjoy the amenities at Marriott's Sunset Pointe resort, also located in Shelter Cove. Five floors house 111 luxurious units with gorgeous views of the cove and the resort grounds. The upscale two bedroom villa-style units contain enough space to sleep six guests comfortably, and include desirable amenities like washers and dryers, outdoor balconies, full kitchens, and more. Complemented by free WiFi and modern furnishings, it's no wonder why the villas at Marriott's Harbour Point are so popular among families and small groups alike. Are you ready to lock down your very own accommodations in Hilton Head? Fill out the form on this page to learn more about the ownership opportunities currently available at the Marriott Harbour Point at Shelter Cove, or call a representative at 1-877-815-4227 today. Buying a timeshare at the Marriott Harbour Point resort can result in years of amazing vacations to Hilton Head for a fraction of the cost. Unlike traditional timeshares that carry inflated and excessive prices, timeshare resales are offered for sale by current timeshare owners. This means that you can find the same great ownership solutions at the Marriott Harbour Point resort for much more affordable rates—you can even find units priced up to 70% lower than retail. With this opportunity to save, you can guarantee a future of affordable trips to Hilton Head each and every year. Additionally, you won't have to settle when choosing a timeshare resale. Harbour Point resales come in the form of deeded fixed and floating weeks spread throughout Marriott's Silver, Gold, and Platinum seasons, giving you a variety of ownership intervals to consider. You'll be able to find a unit that matches your specific vacation preferences as well as your price point. You could also use your resale at the resort to enter the Marriott Vacation Club for added benefits and perks. The Harbour Point at Shelter Cove resort is affiliated with the Marriott Vacation Club, one of the world's most popular timeshare brands. With very few restrictions toward resale buyers and a complete catalogue of luxury resorts, there is no better club to buy into. Resale buyers can start making reservations at the Harbour Point using their deeded week immediately, but upgrading to Marriott Vacation Club Destinations points can unlock added bonuses. You can switch to an easy-to-use points-based system for making reservations, and you can also exchange your timeshare internally for stays at other Marriott resorts. A membership with Interval International can help you maximize your timeshare resale ownership. Affiliated with the Marriott Harbour Point resort, Interval International can allow you to trade your Hilton Head accommodations for stays at other resorts spread all around the world. 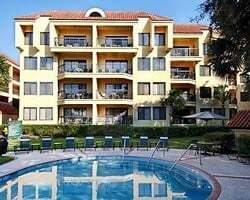 The resort is also a Premier rated resort with Interval, noting its above-average accommodations and amenities, as well as increasingly positive reviews from former guests. 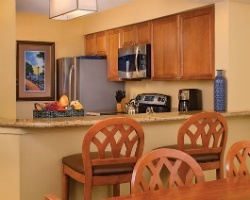 You'll have everything you need directly on-site at the Marriott Harbour Point Hilton Head resort. Chock-full of amenities and services designed to maximize your vacation experience, you'll be able to fully enjoy your trip to Hilton Head. Lounge by the swimming pool or sundeck during sunny days, or exercise at the fitness center or tennis courts. Head to the on-site marketplace to pick up quick essentials and snacks, or seek out one of the resort's daily coordinated activities for all ages. The area surrounding the resort is filled with wonderful things to do and see—start your vacation by visiting popular sites like Coligny Beach for endless swimming and sunbathing. Golfers will find themselves in a veritable paradise, with dozens of PGA-sanctioned courses designed by the game's greats. Visit Harbour Town for unique dining and shopping, or kayak through the island's waterways and inlets to truly escape into nature. Already Own at Marriott’s Harbour Point at Shelter Cove?